Tilt Sensor Watch – Been There, Done That | OhGizmo! Ever since I was a kid I’ve been a fan of watches but I’m not talking in terms of style. No, if I’m going to the trouble of strapping something to my wrist it has to do far more than just display what time it is. As a result part of my brain now has a pretty useless section devoted to storing the past 20 or so years of the evolution of digital watch technology. 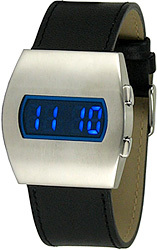 The Tilt Sensor LED Watch is available from ThinkGeek for $49.99. I just bought this watch and I like it. It may not have a lot of features (just time and date), but I like watches that are out of the ordinary. I have already gotten several compliments on it. People think it looks futuristic when they see it with the display off then say wow when I show them how the tilt sensor works. A lot of websites have said that you simply shake your wrist to get it to light, but this is not the case. It only turns on when you tip it about 30 degrees toward (the normal watch viewing position…for me at least) you and stays lit for 10 seconds. The only thing I might change is the band, I prefer metal bands over leather.